The Comedy: Jake, Trixie, and Spud must transport a wild mystical unicorn from Coney Island to Central Park during holiday rush hour. The Action: Racing against time to rejoin the unicorn with its elusive herd, the gang is pursued by sinister carnies who are looking to exploit the magical creature for profit. 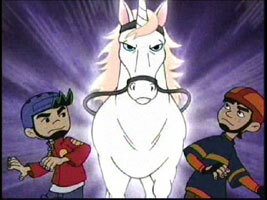 "Flight of the Unicorn" is an 11-minute episode, usually aired with "Fu and Tell".